CG Joinery - Carpenter based in Bridlington, North Humberside. Orders can be placed from anywhere in the country as items are manufactured in my workshops and shipped out to you. 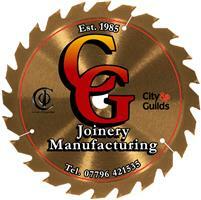 Here at CG Joinery we provide a service to suit your own specific requirements for purpose made joinery, and more. Made in our fully equipped joinery workshops along with steel fabrication workshop for items needed on specific farm gates and high security doors. We provide services for common types of work and bespoke work tailored to your designs and needs. We can produce virtually anything in timber and steelwork incorporated too with items such as Stairs, windows, Doors, Gates, Tables and other furniture like Book Cases and Dressers. We do a lot of work with Reclaimed Timber to construct anything as small as a cupboard door to a full hairdresser’s salon using old reclaimed timber, and new wood to look old and with a fine patina to a 100-year-old look achieved with an in-house technique original to CG Joinery. We also work alongside Sound Solutions in York, one of the country’s finest sound reducing specialist, we make soundproof doors and windows for flats, nightclubs and houses these can be made high security with steel and aluminium finished for security and hard wearing. Basically, if you can think of it we can make it for you with an honest and reliable attitude to business where of course the customer is the most important "cog" in the machine. These lights are extremely individual due to being totally hand made by C G Joinery in our Yorkshire workshops. Each piece of timber has a varied history for instance, coming out of a 300-year-old hotel refurbishment to a Victorian townhouse or from a forest. Each piece of timber is selected, designed and turned into an individual physical artistic creation to bring light and spender to your room or building, bulbs used are Crystalite CFL Antique Squirrel Cage readily available.